In the same context in the world of art and architecture of the recent past, there arose a period that came to be called Minimalism. Mies van der Rohe and Buckminster Fuller often used the expression, “Less is More.” Like Occam’s Razor, the final solution is shorn of extraneousness; details fall away and simplicity is the result. Like many movements in art, aberrations emerge. In this case, some examples became so minimal in composition that they neared sterility. 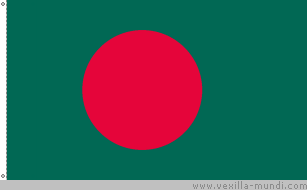 Among flags of nations, a perfect example of this tendency is the flag of Libya, which is one solid green rectangle, “signifying nothing.” With merely the addition of a red circle on a green field, the nation of Bangladesh has a striking symbol. Similarly, Japan’s flag is a red circle, but on a field of white. Among other flags of the world there are a few more two-color flags from nations remotely scattered across the globe. One of the most striking two-color national flags, one that evokes a strong image of the land it represents and the industry of its people, is that of the Ukraine. Its flag is a design divided horizontally in half. The lower half is yellow, the upper half a sky blue color. Ukraine is known for its vast fields of small grains; their flag is a landscape of their land and its colors work well together. Similarly, Minnesota’s land is well known for its blue skies and waters, snowy plains and green hills, and there is the constant presence of the North Star. ~ by marcstratton on 16 March 2007.